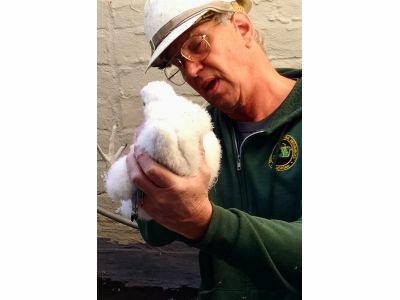 05-19-2018 The chicks are banded! The chicks were banded by three Michigan DNR biologists on Thursday May 17. They looked healthy and did well during the banding process. It looks like this year’s clutch of Peregrine chicks consist of three females and one male. Assigning gender is a “best estimate” based on the size of the legs and feet at this age. In raptor species, females are larger than males. The chicks are all now sporting their new identification bands. There are black over blue bands on their left legs and aluminum federal ID bands on the right legs. Rebecca and Kewpee did not handle the banding as well as their offspring. There were a lot of close fly bys and Rebecca was quite intent on getting the evil banders to leave. They even used an umbrella to keep her from getting too close. But, she was so defensive that she made contact with the banders, the umbrella, and the nest box. In the process she injured one of her feet and blood could be seen on her feet and tail feathers. However, the bleeding did not last long, and she was feeding her chicks later that day and staying very close to the nest box. We have been watching closely to be sure we don’t see any complications. At this point, she is acting normally and can land, and grasp a railing or food just fine. In addition to their official band numbers, we like to provide the chicks with community names. We are looking for some help coming up with names for the chicks. Please send us a message through the “contact us” button on the website if you have suggestions to submit.